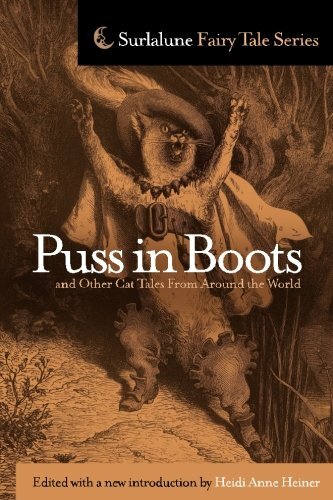 I was surprised to find, in Puss in Boots and Other Cat Tales From Around the World, a category dedicated to "The Kind and Unkind Girls", also known as "Diamonds and Toads". In a couple tales from Greece and Italy, the cats are actually the ones who reward/punish the girls! "The Cats" from Greece features a household of cats that reward an old beggar woman-refreshing to see a heroine who is a different age. "Little Convent of Cats" from Italy includes the detail that it was from the time when all animals could speak, and the cats were very rich (in some of the tales the cats speak, in others they use actions to show the heroine what she should do). In the other tales, though, the cat is a friend that helps her because she is kind enough to feed it. Sometimes there's a cat and a dog who are provided for her as helpers at the house where she takes up service for the old witch/benefactress figure. In an Austrian tale, the cat and dog were an enchanted Prince and his sister (and the Prince marries the heroine). In the others they appear to be regular animals who just appreciate being shown kindness and help her fulfill impossible tasks and/or choose her reward for service wisely; when the unkind sister shows up and is cruel to the animals, they simply let her suffer. Reading several "Diamonds and Toads" tales back to back, certain themes emerge. One theme that's very prominent in many fairy tales is that, if you are kind and compassionate, those who you help will return the favor when you need it. The animals that the heroine gave food to helped her accomplish tasks like fill a seive with water, or provided her with food and drink when she needed it. The animals were also key in the episode at the end of her service when she was given a choice as to her reward-they showed her which box/basket to choose that would really be full of treasure, no matter how unassuming it looked at first. And of course, whatever the good heroine does, her wicked sister does the opposite-mistreats those she comes across, is a lazy worker, and chooses whichever payment she thinks will bring her the most rewards. It's clear that the kind sister is also rewarded not just for being kind to people, but also to animals and nature. In some tales she helps and respects various other things, from a fence, to trees and a brook, which also help her in some way later. The whole idea of being kind to the earth is even more pressing in our current day and age, and certainly we and future generations will benefit it we make wise choices now. Another key difference between the sisters is their expectations. The kind sister is rewarded because she is kind no matter what-even when it seems like it won't benefit her at all, but because that's who she is. She also doesn't assume that she deserves a large payment for her services and is surprised to find treasures (which in these stories, never came out of her mouth as in "Diamonds and Toads," which would really be quite unfortunate). The other sister only goes out in order to get the same treasures, is a lazy worker who doesn't share her food with the less fortunate or respect the earth around her, and doesn't suspect that it was the kindness that led to the original reward. In fact these tales love to come up with various ways to torture the cruel sister and her mother. The box/basket she chooses as her payment is filled with everything from snakes and beetles, to devils and demons, to flames that burn her and her house down. Sometimes there's a bear that knocks on the door and wants to eat the girls, and the wicked sister from "Little Convent of Cats" ends up with a donkey's tail growing out of her forehead. Other notable features of these stories: One features a girl being curious and doing what she shouldn't do, but rather than being punished it's seen in a positive light-she was told never to open the pots in her house of service. But before she leaves, she wonders what's inside and opens them, and poor souls fly out and thank her for releasing them. Another story from New Mexico has an interesting parallel to Little Red Riding Hood. It's one of the tales where a bear comes knocking each night-the kind sister is told by the cat how to avoid it, but the unkind sister lets the bear in, and there follows a series of "What big X you have," which the bear follows with "The better to X with" and all accumulating, of course, with the big teeth that are all the better to eat you with (although this cat saves the unkind girl for her sister's sake). 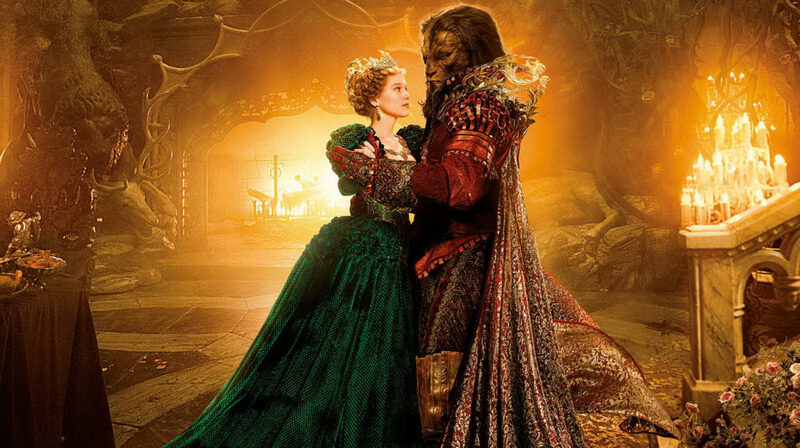 I'm thrilled that Christophe Gans' Beauty and the Beast, starring Vincent Cassel and Lea Seydeux, is available on Netflix, since that's basically my only source of entertainment. I had really been looking forward to seeing this version of my favorite fairy tale. To be fair, I wasn't able to sit down and enjoy the whole film in one go, or purely focus on it, but catch bits and pieces over a week and jot down notes in between. It's nice to see a retelling of the traditional French version, but with clear nods to Cocteau and Disney. But overall, I would say this film is worth watching for the visuals, but has an incredibly disappointing romance. One thing I appreciated in this film, compared to other versions, was more realistic sibling relationships: I would love to read/see a version of BATB someday that really explores the relationship between Beauty and her sisters more. 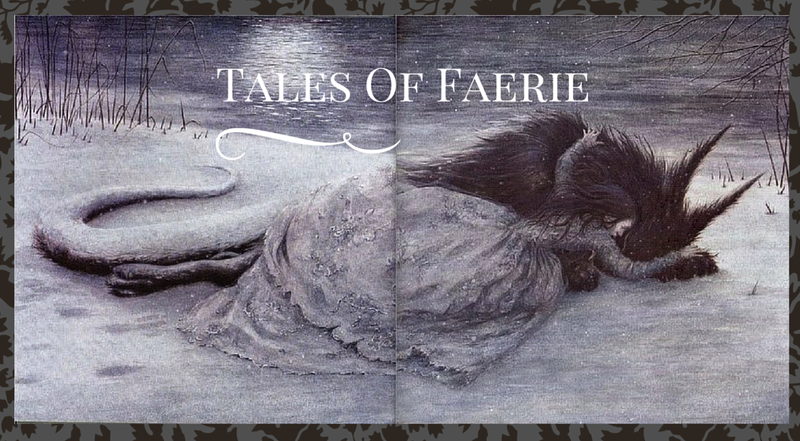 The traditional fairy tales has them painted extremely black and white; the sisters ugly and evil and Beauty beautiful and often annoyingly perfect. There's so much potential character depth that could be explored from their reactions to losing their wealth, and a lifetime of your younger sister being your father's favorite (not to mention obviously prettier than you). On the other extreme, there's the Robin McKinley novels, which I adore-but in those the sisters are all a little too perfect; neither they nor Beauty has any real flaws. The Gans version tended to be on the traditional fairy tale side, but you do get a sense of pity for the sisters as their neighbors laugh at their disgrace in their poverty, and when their father comes back from the Beast one of them says "this is all our fault," taking ownership rather than blaming Belle. Belle is more human-she admits she sulks when she finds out her father is going to recover his ship, and the request for a rose isn't made in the "I just want my father to be safe because I'm perfect but to make everyone feel better I'll make a super simple request" way, but as a kind of protest. Then when Belle returns home, we feel sympathy for the sisters again, for how much worse their life has gotten because of their brother's debts. They aren't spiteful to Belle at all, in fact the brothers' storyline provides an interesting twist in why she didn't return to the castle as intended-and the sisters are honestly glad to see their father doing better. The Romance (or lack thereof) (warning, spoilers ahead:) But then we come to the introduction of the Beast. I find it interesting that the filmmakers, while working primarily from the classic French Villeneuve/Beaumont tale, chose to keep the "angry selfish" Beast made so popular by Disney and not the gentlemanly Beast who wants Belle to be as happy as possible in the castle. Especially given that Disney's tale has been mostly criticized for its Stockholm Syndrome similarities, and that since then our culture has been obsessed with other troublingly abusive relationships (50 Shades of Gray comes to mind), I would expect a heightened sensitivity to the character of the Beast, and avoiding those pitfalls. Yet I find this Beast to be far worse than the Disney (and when I refer to the Disney Beast I mean the 1991 cartoon, still haven't seen the live remake, although I've read all the fairy tale bloggers' reviews and am somewhat familiar with the major changes). So he starts out creepy and cruel, which most people have grown to expect from the Beast. Maybe they figure it's better cinema to get you scared at first, so the romance is more dramatic later on. To be fair, the Beast does apologize the next night, although he doesn't say what for (and there is so much...it implies he's only sorry for jumping on the table, not necessarily for, say, imprisoning her for life and cruelly telling her to forget her family because there's no chance she can ever escape). Then Beauty makes a deal with the Beast, she'll dance with him if he allows her to visit her family again. And all of a sudden she's resting her head on his chest (an homage to the Disney ballroom scene?) and it seems she has affection for him, based on...what?? It seems not only unwarranted but way too sudden. In the Disney, Belle shows no hint of affection for the Beast at all for a long time. The first turning point is when she tries to escape, and the Beast gets hurt protecting her from the wolves. This is the first time that he actually sacrifices something for her. She makes the decision to return and take care of him, fulfilling the promise she made to stay there in place of her father, but still no hint of romance-she thanks him for saving her life and that begins a montage indicating that a long span of time is spent getting to know each other, playing together (snowball fights), reading, and the Beast really trying to be better-relearning to eat with silverware, giving her the library, etc. Only after this, in the famous ballroom scene, does she lean her head on his chest and indicate the least bit of attraction to him. 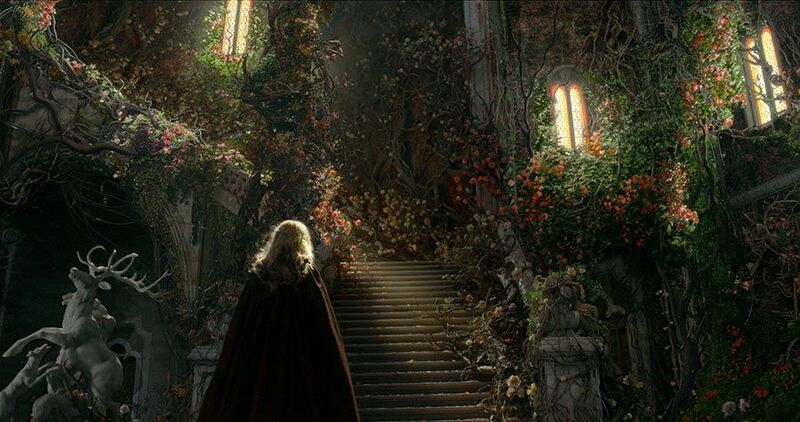 The Gans sort of has a scene similar to the wolf scene, where Belle attempts to run away, only the Beast doesn't run after to protect her, but catches her. She falls down backwards on the ice, and after he attempts to kiss her, she falls into the ice. Then, after she's back safe and dry in the castle, he says she can go home, and all of a sudden she seems flirty and playful with him-as if he wasn't merely keeping the promise that she herself bargained for. It was hardly the act of selflessness that the Disney Beast shows when he lets her go, permanently, expecting to never see her again and therefore remain a Beast. 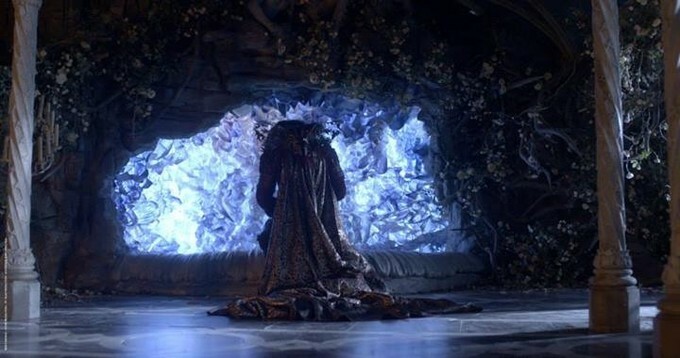 Along with that, the Disney Beast's backstory, although it has holes, indicates that his selfishness, although inexcusable, stems from him being a young, spoiled Prince. This Beast's backstory, while interesting, is really more troubling than anything else. What was the purpose of revealing the backstory? Usually it's to make the Beast more sympathetic/human, but he just seems like he's always been a jerk. He had more interest in hunting than spending time with his wife, and broke his promise to stop hunting the Golden Deer. You might think he would have learned his lesson, and become more sensitive to his partner's needs, but the opposite happened. Plus, the fact that he's older and previously married, compared to Belle's situation-has only lived under her father's house, and to all appearances has never dated before, just makes their relationship seem more unbalanced and disturbing. Not that relationships like that can't work, but they require a lot of intentional communication as you work through what would be a lot of baggage. I kept expecting the relationship to continue and show the Beast growing and changing, like in the Disney, but Belle's return to her family is so abrupt (after only...2 days?) and somehow on her return, her one wish is to be with him again. It's so out of the blue. To be fair, the Beast has a few (minor) redeeming qualities. When he lets her go, even though he's just keeping his word, this shows growth because he broke his promise to his first wife. He sends Belle with the healing water, and later stops the giant statues from killing her and her brothers (which also means...that he and the stone statues were stomping on a bunch of people like bugs, for looting the castle. The thieves were jerks but that doesn't excuse murder. Or at least I'm assuming people died? It looked like it but was hard to tell and didn't seem like there were that many people to begin with). Still, that's hardly enough to warrant trust and a confession of love, which is what happens next. I don't agree with everything in this review from Indiewire (clearly I enjoyed the introduction), but this excerpt seems pretty accurate: "The love-crossed pair at the heart of the story share little screen time, and the precious few moments they do occupy even a frame together are marked by a decided lack of chemistry and mostly screamed threats from the Beast that often verge into territory that has the unnerving undertones of sexual assault. At the very least, the Beast is mostly intent on capturing Belle’s heart (or maybe just her body) by alternately threatening her with physical (and sexual) harm and greasing the wheels with some jewel-covered gifts and impressive gowns"
In fact the whole relationship was so baffling to me I was even wondering if somehow it was supposed to be exaggerating to make a point, sort of like how Cocteau meant for his ending to be disappointing, but it doesn't seem like this was the intent. Who else has seen this movie? What did you think? Episodes 5A and 5B: Two fascinating stories about Koschei from Russian folklore. He's a fascinating villain I was eager to learn more about. The first tale has a gender reversed Bluebeard element to it, but with a very different result! Also an opening scene in which bird magicians fly in through a window and ask for brides, which made me wonder if David Bowie's entrace as the Goblin King in Labyrinth was a nod to this story? Episode 32-Tricksters: Wager-I'm sadly ignorant of trickster tales; they tend not to be as common among people who rewrite or analyze fairy tales. The tales can have troubling moral implications but are highly entertaining if you don't take them too seriously. 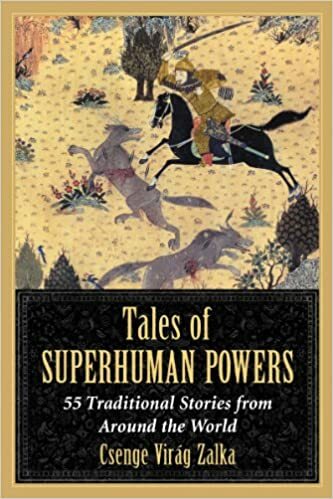 There are several shorter tales in this episode from around the world, including a version of a Tortoise and the Hare race, in which the Native American Coyote races a turtle; there is also a story about Anansi the Spider, and Loki and Thor.